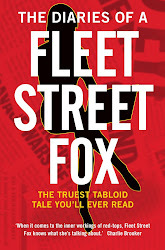 fleet street fox: Les cheeky sods. IT'S amazing the way you can always find a lawyer to work for you, even if your case is hopeless. There's the one who swore blind I could get a few grand from my ex-husband in our divorce, and another one who charged that same ex thousands to argue that I couldn't, and who between them took twice what we were arguing over. Then there's the truly expensive ones who take £50,000 and upwards from the likes of Jeremy Clarkson and Ryan Giggs for injunctions which either won't hold, are extremely unreasonable or threaten someone who has every right to express an opinion with jail if they do. I expect some of this last group will be engaged, at some point, to protect the reputation of the Olympics, which is costing us up to £24bn, creating jobs mainly for foreign workers forced to live in squalor, and now wants to take control of common nouns and stop people mentioning this massive abortion of time and money we could well do without in the midst of a double-dip recession in derogatory terms. More importantly there will be a lawyer somewhere rubbing his hands over this little stunt, in which the French city of Angers has officially launched action to sue the Queen for the Crown Jewels. The city was home to the House of Anjou, which gave rise to the Plantagenet monarchs who ruled Britain and whose dynasty came to an end when the last one - Edward, Earl of Warwick - was executed in 1499 after Henry Tudor seized the throne. The Frenchies reckon this was a crime against their state, and they've asked for 513 years of backdated compo which would amount to billions, but for which they're prepared to accept the Crown Jewels as payment. They've even got a display spot picked out for Betty's crown. 1. The Plantagenets were a combination of rulers from Anjou, Normandy, and Wessex. They were as much wurzel as they were ooh-la-la, and we're not being sued by the city of Gloucester, are we? Don't be so daft. 2. The Plantagenets were a cussed, determined bunch who fought The Hundred Years' War against the French throne. I note the current city of Angers has given up on this particular front. You're not very Plantagenet, are you? 3. Edward, Earl of Warwick was what historians call 'simple-minded' and unable to tell a goose from a chicken. He was executed for treason after plotting to escape the Tower of London with the son of a Belgian accountant who pretended he was the rightful king of England. If you want him, you can have him. 4. If Angers wants to take credit for the Plantagenets, they will also need to shoulder responsibility for the Third Crusade (Richard I), Agincourt (Henry V), the conquering of Wales (Edward I), the failed conquering of Scotland (Edwards I, II and III) and the lack of decent medical care which gave rise to the Black Death, wiped out a third of the population and saw Richard II quell the entirely-justified Peasants' Revolt of 1381 with murder, executions and lies. 5. You will need to take Prince Andrew too. While the petition calling for a formal Royal apology and compensation could in theory start a legal case, it's fairly unlikely of course. Not just because the new French president hasn't had a chance to try the soup at Windsor Castle yet, but also because everyone realises that quibbling about what happened centuries ago is a futile business. If they found a lawyer and actually filed a suit, they'd find that we're not Plantagenets any more either and we cannot obliterate them with our mighty war machine (currently searching bags in Stratford), sink them with our navy (with carriers the French half-own on which we can't park any planes), or even fire off an angry solicitor's letter because we can't afford the legal bills. No, we'd have to rely on our wits. And mine tell me that if the Frenchies want the Crown Jewels for the execution of a simple-minded Royal we should let them have the lot. In return we'll very politely ask for compensation for the Norman invasion, the serious telling-off we had to give Napoleon on more than one occasion, the costs of having to rescue them from two world wars, the €227billion of debt they currently owe us, their helping the Argentines with Exocet missiles while we were fighting them, their being arseholes to so many minorities for centuries they all moved to Britain, truly terrible drains and inflicting Jean Michel Jarre on the rest of the planet. A set of Crown Jewels should just about cover it, if they've any to hand. 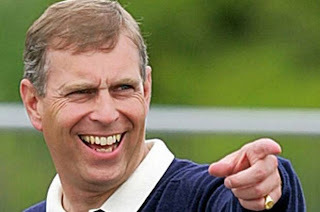 We'll write the receipt on Prince Andrew's forehead, because that way they'll have to keep him. "That's not a goose! Or is it?"